The Art Deco style was popularized at the Paris exposition of International Industrial and Modern Decorative Arts in 1925. Although beginning in France, America became the center of the artistic movement and the Art Deco style in architecture became the first significant popular style in the United States to fully separate from the revivalist tradition. New materials, such as Bakelite, steel, and aluminum were used in buildings. Plating brass with nickel or chrome created an entirely new portfolio of bright, sleek hardware. The new neon lighting gave art deco buildings a futuristic glamour of shadowed light with bold lines emphasizing the vertical aspect. Other features of Art Deco are smooth wall surfaces of metal or stone, geometric shapes with stepped, pyramidal towers and the distinctive sunset lines. 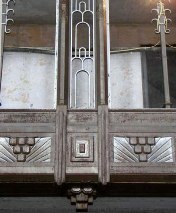 The Art Deco style was applied to jewelry, clothing, furniture, and handicrafts. Industrial designers made use of Art Deco motifs to embellish streamlined cars, trains and kitchen appliances. This ornamentation often consists of parallel straight lines, zigzags, chevrons and stylized floral motifs. As a machine age movement and the first of the Modern style, Art Deco attempted to interpret the streamline forms of a modern society. 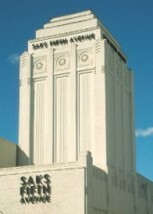 The largest concentration of Art Deco buildings are New York City skycrapers and Miami apartment houses. < td> •	Setbacks in walls, flat roofs, emphasis of geometric forms. < td> • Decorated iron grille work • Hard-edged low relief ornamentation around door and window openings.